INTRO. I am really reluctant to post anything at the Pub unless I can include photos and spend a couple of hours writing. As you can see that isn't working too well, since my posts are too few and far between. However, when I received this Cross Apogee from my daughter and son-in-law I knew it was time to get back on track and write about this outstanding pen. APPEARANCE. This Apogee is the "Frosty Steel" finish and it glistens - catching and reflecting blue light at multiple tiny points across the barrel of the pen. I know we get pens primarily to write with but this one is pleasant just to look at. At first I thought the nib looked a bit small for the size of the pen but have since come to see it as corresponding well to the tapered opposite end. It is a very handsome pen. NIB. My previous experience with Cross is that they are wet and wide writers. So, I ordered an XF nib expecting it to write like a fine nib, and I was not surprised. The nib is 18kt gold but still stiff. Not as stiff as an ATX steel nib but stiffer than you might think for an 18kt nib. Apart from that, it is an exceptionally smooth and consistent writer. So far, I am using Cross Blue ink, which I really like. With the XF nib, it is perfect for my very thin Clairefontaine paper: no bleed through. It writes on first contact every time - no flow issues whatsoever. WEIGHT. On the top heavy side with the cap posted. But I prefer writing with the cap off, so that is not an issue for me. Without the cap it is a comfortable weight (sorry - no grams) - though heavier than a resin pen. CLIP. The clip is really unusual. It is spring loaded and the end has to be depressed before you can put it in your breast pocket. It is a very stiff spring and requires quite a lot of pressure but it can be accomplished with one hand. INK SUPPLY. This is strange: Cross does not supply converters with their fountain pens. You have to order it separately. Fortunately, I was aware of that and so I ordered it along with the pen. The converter is a well made screw-in converter. I like the fact that it screws in rather than the push-in style of most other converters. It is very secure. CONCLUSION. I love this pen - can't put it down. It is so pleasant to write with. My only criticisms are that an 18kt nib ought to have more flex to it, and Cross ought to include the converter with the pen, like every other pen maker does. Cross seems to be kind of out of touch with their customer base. You can tell also by the way they write their pen descriptions. Whoever writes that stuff, obviously has know idea what pen enthusiasts care about. 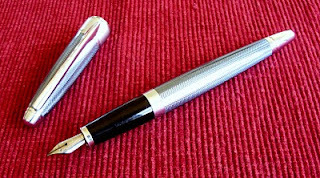 They write about the pens as though they are fashion statements rather than marvelous writing instruments - but I'm a guy and that's the way I think. Or, maybe they aren't that interested in pen enthusiasts. As the oldest pen manufacturer in the world, you would think they would have inky fingers - if you know what I mean. Not that it matters much how they advertise, the Apogee is a very fine pen! UPDATE. Since writing this review, Cross recently redesigned their website, which finally includes pen specs and lists the "optional converter". Their website went from adequate to excellent.